In a past post, I discussed the density-bonus plan being floated around City Hall. (Council will consider the Downtown Design Commission's recommendation tonight.) I'll discuss density bonuses in more detail in future posts. But the gist is that the City is considering charging developers more -- possibly millions more -- to develop high-rise condominiums and office buildings. It seems to me that the people who are pushing density bonuses have their analysis backward. They start by trying to figure out what additional concessions the City can extract from new development. But I think it's smarter to start by figuring out what downtown high rises already provide. Imposing millions of dollars of special obligations on new high rises will discourage the marginal ones; we need to know what we stand to lose. So let's get to it. The three main benefits of downtown condos are housing, the property tax windfall, and the development of an urban environment. I've explained elsewhere why adding lots of new housing downtown -- even luxury housing -- will benefit home buyers of all income levels. Downtown condo buyers do not materialize out of thin air at closing. If they do not live downtown, they will live somewhere else (unless they intend to use the condo as a second home). That "somewhere else" will not necessarily be central Austin, but it's likely, since condo buyers can afford pricey homes and apparently want to be close to downtown. By buying downtown instead, they will free up housing for others. The extra housing supply will "filter" through the market. Downtown condos are especially good for families with children for the same reason. Downtown condos draw singles and childless couples, reducing the competition that larger households face for central Austin housing. The effect of the extra housing supply is hard to quantify, but we can put it in perspective. There were 1,087 homes sales during the first 9 months of 2007 in MLS areas 1B, 2, 3, 6 & 7 (most of central Austin). There are 927 units in the three downtown condos opening in the next few months: 360 (430 units), the Monarch (305) and the Shore (192). Downtown condo towers are simply vertical infill subdivisions. Extra housing supply is not an unmitigated good. Current homeowners won't see as much home appreciation. No one argues, though, that Austin needs higher home prices (at least not publicly). A single condo tower generates an enormous stream of property taxes. Because downtown high-rises impose little extra cost on the city or schools, most of that income is a windfall. In some cases, it is a windfall worth tens of millions of dollars. 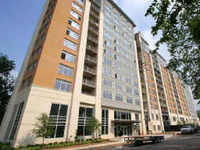 Example: Milago, on Rainey Street, has 240 units, so it is relatively modest compared to some of those going up now. But it gives us some idea of what the others will produce. To calculate the extra property taxes generated by Milago we need to know how much the tax assessor thinks the building is worth. It's actually pretty easy to get a good estimate using the tax records. By my calculation, Milago has 264,000 square feet of living space. Using a very conservative estimate of $300/sf, the development as a whole (building + land) has an appraised value of over $79 million. The land underneath Milago is appraised at $3,635,810. The building itself thus has a net appraised value of at least $75 million. Using the 2.52 tax rate, Milago generates $1,890,000 per year for all of the taxing jurisdictions. $1,500,000 of that goes to the City and AISD. Remember, this is an income stream. The right to an extra $1.5 million per year is worth a whole lot more than $1.5 million. It's worth at least $30 million because the City/AISD could sell $30 million worth of bonds and use Milago's taxes to pay the carrying charges indefinitely. (I'm assuming a 5% interest for the bonds.) In fact, Milago's stream of property taxes is actually worth a lot more than $30 million, since we expect the property taxes to increase over time. Several of the downtown high-rises will generate even more income. 360 will have 430 units, 80% more than Milago. Its property tax stream may be worth well over $50 million. To be fair, we have to deduct the extra costs that these condos impose on the city and schools. But these costs are minimal. Take schools first. Few of these households have children, so they don't "use" the school taxes they pay. Condo dwellers may actually reduce AISD's costs if they permit more families with children to live in central Austin, where AISD has under-used schools. As for costs to the city, downtown condos sit on land already served by municipal infrastructure. And they use infrastructure that is compact and cheap to maintain -- no new roads, short water and electric lines, existing police and fire stations, etc. The marginal cost to the City of one new high rise is not zero, but it is a very small number. Even if Milago costs the City an extra $250,000 a year, it still generates a stream of property taxes worth $25 million to the City and AISD. We have to consider one other wrinkle. As I just got through arguing above, a lot of condo buyers would live somewhere else in Austin if they could not buy a condo. They would be paying property taxes anyway. I'm not sure this radically changes the calculation, though. If we add less housing downtown, we must add more in the suburbs. Substituting a suburban single-family home for a downtown condo is a bad deal for the City and schools. AISD has to build and staff new schools and run extra buses. The City has to build new police and fire stations, hire new police officers and fire fighters, buy new police cars and fire engines, build new roads, maintain more roads, install new traffic lights, and build and maintain new power lines, water lines, and sewer lines. The extra marginal cost is potentially huge: In 2008, the City will spend about $150 million more on public safety and roads than it collects in property taxes from all sources. Downtown condos are a bargain. They really do generate huge tax windfalls for the City and schools -- likely tens of millions of dollars. If you are not satisfied with this analysis, fine. I'm sure the City could come up with a more accurate estimate. It seems to me, though, that someone ought to work up an estimate; we need to know what we stand to lose before we start taxing condo developments with millions of dollars in "community benefits." Lots of people are excited about downtown development. I'll bet they aren't giddy over the prospect of all that extra tax money or housing supply, though. What people are really excited about is the emergence of a true urban environment. An urban environment is not just an outdoor mall (which arguably is what Second Street is at this point). It is a place where people live in stimulating proximity to one another. It's easy to spot the trappings. Specialized restaurants. Bookstores. Coffee shops. Corner grocery stores. Museums. Art. But at its core it's really about the synergistic energy that emerges when a lot of creative people live near one another. The image that best defines urban life is not the quirky coffee shop; it is the image of hundreds or thousands of people spilling out into the streets at all times of the day. If you doubt the attractiveness of urban life, ask yourself how many people visit New York City to tour the single family subdivisions in White Plains. Even people who don't want to live the urban lifestyle find it enticing in short bursts. Of course, you can't have an urban environment without lots of people living in close proximity. And you can't have lots of people living in close proximity without lots of high rises. A new high rise downtown certainly benefits its residents, but it also benefits everyone else who will enjoy the richer, more vibrant environment these new residents make possible. We don't have a true urban environment in Austin yet. Downtown development promises to deliver one. But it's not guaranteed. If we want to raise the odds of it happening, we should encourage the construction of as many new high rises as possible. Saddling them with onerous obligations to provide "community benefits" is a pretty poor strategy for doing that. Downtown boosters frequently cite congestion mitigation as a benefit of new high rises. I honestly don't know what the net effect of all this downtown development will be. I suspect that it will reduce rush-hour congestion, perhaps generating a traffic flow in the opposite direction. On the other hand, there will be more congestion in the off-peak hours. That is a negative externality. However, it will largely be felt by the people who live downtown. They ought to expect that is part of the deal. There are also environmental benefits. Mainly, it will relieve pressure on development in outlying areas. While a high rise generates more pollution and carbon than a vacant piece of land, the energy use per capita is less than a household in a single family home. I'll talk about how density bonuses really work in some future posts. Before we debate their merits, though, we need to understand what downtown high rises already provide, and what we stand to lose. Update: According to this site, high-rise condos actually use more energy per square foot than single-family homes. Of course, condos tend to be much smaller than comparably priced single-family homes, so they still may consume less net energy (even if the claim is correct).